Choosing from all different foods available can be daunting. Here’s our guide to help you make the best choice for your puppy. If you look at the packaging, you’ll see that most of the foods available are described as complete foods. This means that they offer all the nutrition your puppy needs. With its low water content, you can store a lot of food in a small space; a real help if you have a large dog. Chewing the kibbles in Pedigree® Puppy Complete helps maintain clean, healthy teeth. Some puppies may be put off dry food to start with, but normally grow to like it with time. Softening the food in a little warm water can help them make the switch. A bowl of wet food has half the calories of a bowl of dry food. So if your puppy loves to eat, feeding wet food means there’s less chance of eating too many calories. The high moisture content also helps make sure your puppy takes in plenty of fluids, and can decrease the risk of urinary tract infections. Young puppies usually find it easier to chew and swallow wet food, so it’s good for fussy eaters. Mixing dry and wet food is popular because it combines the benefits: helping to maintain healthy teeth and good urinary tract health. 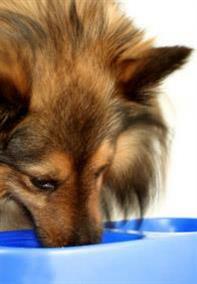 It’ll also give your puppy more variety and help them accept different types of food later on. With our Pedigree® puppy foods, your dog will always get the right nutritional balance. So feel free to experiment and find out what your puppy prefers. Just make sure that they always have plenty of fresh drinking water to keep well-hydrated.